Wherever you live, nature is always near, with entire worlds to discover around the trees in your yard, in the carpet of grass or beneath that pile of rocks. With school vacations rapidly approaching, you may already be thinking of ways to keep your children or grandchildren busy during the long summer months. Well, how about setting up your own Nature Camp! An appreciation of nature will stay with children forever and teach them the importance of caring for the environment and all living things, including themselves. A stroll through the woods or a nearby meadow, observing or gathering things of interest along the way. Spend some time watching ants or earthworms, caterpillars or butterflies. Take an evening walk to look for fireflies and bats or to listen to crickets and frogs. Note different species of birds, or look for other wildlife such as squirrels, rabbits or deer. 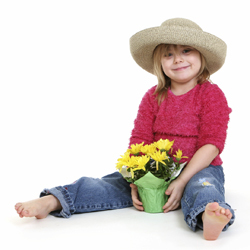 Very young children love collecting things – rocks, feathers, flowers, shells and leaves are a few easy examples. See how many different types, colors, shapes or sizes they can find. Older children might want to start a pressed leaf or flower collection, or capture some insects for identification and observation. Raising butterflies or moths from caterpillars, noting how they grow and change in a nature journal or through a series of photographs to create a scrapbook of the experience. When they’re ready to be released, let the child have the wonder of connecting with nature as their fluttering friends fly free. 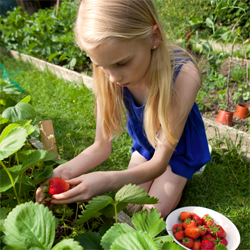 A more extensive nature activity could be to help your child plan and plant a whole garden devoted to attracting wildlife. By planting trees, shrubs, perennials and annuals that attract birds (including hummingbirds) and butterflies, and by installing bird feeders, bird houses and bird baths, you can create a miniature wildlife refuge that you and your child can enjoy for many years to come. We’ll be delighted to help you and your future naturalist select plants suitable for a wildlife garden, plan a backyard refuge or to identify flowers or leaves that have been collected on your nature walks. So, what are you waiting for? 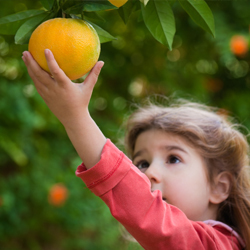 Make the most of this spring with a child and go back to nature!